Which Wich can provide any opportunity you seek. Whether you’re looking for a part-time summer gig or you’re an experienced multi-unit manager looking for a place you can put your skills to the test, Which Wich Superior Sandwiches offers entry-level and long-term career options for YOU! We put “Superior” in our name for a reason; it’s a promise to our guests and a daily reminder to ourselves to always be the best! 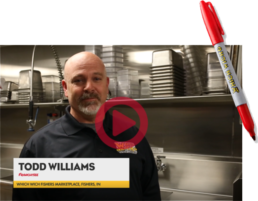 When you join the Which Wich team, you will be joining a group of highly dedicated and motivated restaurant experts who strive to deliver this Brand promise every day. Our franchisees and their dedicated teams create the positive vibes that make our guests say, WOW! At Which Wich, YOU make a difference each day. You have a life outside of work? You need your job to be flexible with your school schedule, family obligations, or other professional responsibilities? Check! At Which Wich, work and life balance are essential for our team members! Once you put on the Black and Yellow, you join a family of positive, high achieving, energetic ambassadors of the Which Wich vibe! The experiences, relationships, and skills you acquire will last a lifetime. Many of our franchise restaurant team members have made the leap from entry-level positions to business owners. Others have pursued leadership opportunities throughout the Brand. If you have your sights set on becoming a manager, a restaurant role can offer the chance to hone your skills in customer service, inventory management and people development. If you’ve always dreamed of owning your own restaurant, Which Wich has a path for you to realize your dream! Great leadership and Which Wich go together like peanut butter and jelly! As a Brand that continues to grow and evolve every day, you have a true opportunity to make a lasting impact on the direction and architecture of Which Wich. We are a global company that is constantly looking for Superior contributors to support our growing franchise community. We’re A Team That Plays To Win. We are aggressively focused on consistently improving the Brand to support the success of our franchisees and the dining pleasure of our guests. Sandwiches are simple, but simple isn’t always easy! This is why we seek out knowledgeable industry professionals with the vibe and skills to help us succeed today and in the future. We have to always stay one step ahead of the industry and our competition. This means we are never content with the status quo. We are nimble and forward thinking; always improving our systems for our franchisees and the dining experience for our guests. You’ll leave the office each day knowing you made a contribution to excellence! Whether you’re looking to be inspired or to inspire others, you’ll find a compelling culture at Which Wich. We are a team of motivated, talented professionals with the unique characteristic of always being open to new options and opportunities. We are looking for team members who have the knowledge and courage to challenge the status quo and drive innovation for the Brand. Whatever your goals may be, you’ll find an environment and culture at Which Wich that will give you the opportunity to succeed! © 2018 Which Wich® Inc. All rights reserved.